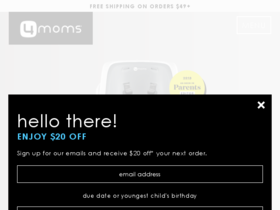 Sign up today with 4moms for a special $20 discount code good for any products including the Mamaroo. Enjoy free shipping on your order of $49+ with this coupon from 4Moms! Shops ale at 4moms for up to 75% off top items including the Mamaroo! Check out 4moms online for their latest special offers.